Slytherin is the most prestigious House at Hogwarts, perhaps in all the Wizarding World. We all know it. Yes, the other houses definitely have their accomplishments. Sure, the House may have produced a few dark wizards here and there, but that's just the cost of greatness, now isn't it? How else will you sway the Ministry if you aren't willing to take risks? With Slytherin credentials, no door in the Wizarding World is barred to you. Do you want instant access to any party? Access even to the secret chambers in ancient schools? Then you need to let everyone know that you're a member of the number one Hogwarts House. And what's the best way to do that? 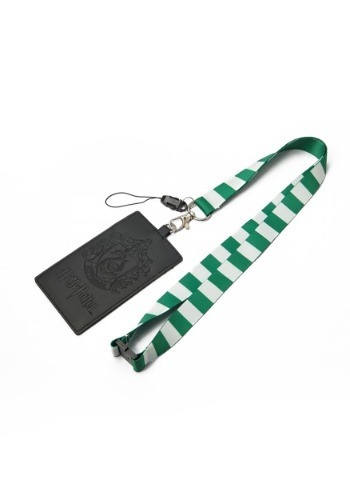 This Harry Potter Slytherin lanyard lets you carry your keys with the confidence of a true graduate of Hogwarts School of Witchcraft and Wizardry. The ribbon carries the dark green colors of the house and ends in a D-Ring, which can hold your keys quite handily. It also comes with a black ID badge sleeve, making it the perfect lanyard to bring with you to special events and conventions. Whether you want to spruce up your work lanyard, or you just want to show off your prestige, then this lanyard is a quick and easy way to do it. You'll be an official Slytherin!